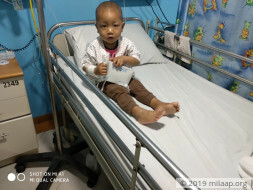 Help 2year 5 month old Alon fight a severe form of cancer. the only treatment for him is chemotherapy which is costing around 6 lakh Rs. Unfortunately, the parents do not have the funds for the treatment and need our help to save their son. Thank you for the love and support given to Alon. I would like to inform you that he is presently being treated with chemotherapy and is reacting well to the same. We are very hopeful of a speedy recovery soon. Please continue to pray for his health. Once again thanking you all. Alon has completed his intensive treatment and he is showing signs of improvement. He went to his hometown,and will be coming for regular monthly follow-ups. We will keep you posted on his further condition. Alon is doing well now and is fortunately, not showing any major side effects to the treatment. He's been admitted in the hospital today (June 13th, 2018) due to fever. The doctors are treating him for the same. He successfully completed the chemotherapy treatment on June 11th, 2018 and also underwent the bone marrow test the same day. We've also received the test reports. However, we're yet to meet the doctor and discuss the further course of treatment. We are all hoping for good. We shall keep you posted. Thank you once again!